Is it possible to make the app shutdown the computer on completion of the last backup? 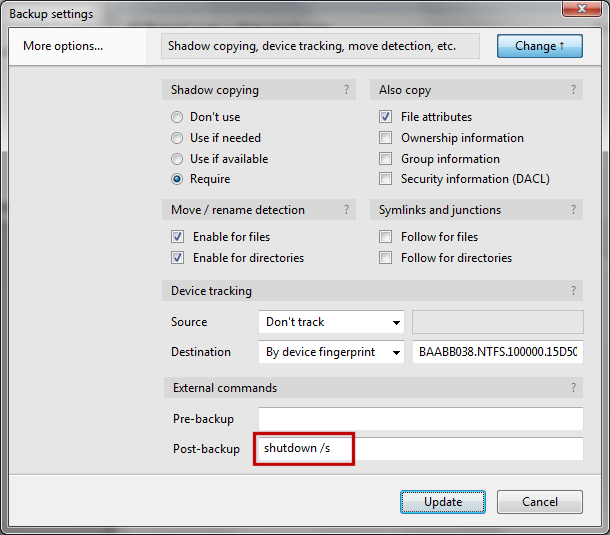 This simply set the app to run a built-in Windows command called "shutdown" as the last step of the backup. Thanks Alex, however I have several backups which on certain days are all supposed to run concurrently. When I used the shutdown command on a particular backup intended to be a one off shutdown, next day I had problems because the backup completed quickly and, as it should started the shutdown. Unfortunate as I wanted to work on. Not being an IT "techie", merely a competent user, can you point me to somewhere where I can find a glossary of available commands? More importantly I foresee a problem with my concurrent backup days i.e. 1st backup to complete will trigger shutdown before others can complete. In Supersync Pro the auto shutdown only triggers on completion of the last backup. How can I achieve this in Bvckup? Your words of wisdom appreciated. It's a standard Windows command, not something that's built into the app. More precisely, it's not even a "command", but rather a program called shutdown.exe that typically sits in C:\Windows\System32. It's just that when you type "shutdown", Windows will first search for a matching program - both in current and in all system directories. It will append ".exe" and search again, so in the end it will effectively expand "shutdown" into "C:\Windows\System32\shutdown.exe" and launch that. How can I achieve this in Bvckup? Your only option is to write a post-backup script that would capture your intended shutdown logic. I don't know how Supersync does it, but if you have at least one periodic or real-time backup, then there's simply no such thing as a "last backup" (as there's always another backup coming up), so there's no event to attach the shutdown to. whereby <backup-id> is the same as above. The way this works is that for each running job there'll be a corresponding x.active file in C:\Foo directory. When the job finishes, it deletes its .active file and then checks if there are any more left. If there are none, it will issue the shutdown command. Alex, thanks your comprehensive reply. As I got my first computer in 1978 you now have me looking for my old MS Dos and 4Dos manuals to relearn batch files etc! This requires R74.20 or newer. What it does is it kicks off all non-disabled backup jobs, then sits there waiting for the app to become idle and finally launches the "shutdown /s" command to bring the machine down.